So I'm driving south on the New Jersey Turnpike for a meeting in Trenton. 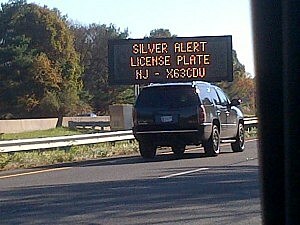 I passed several digital highway signs flashing a Silver Alert with a license plate number. For the life of me, I could not figure out what this Silver Alert was about. After doing a little research [not while driving], I found out “Silver Alert” or “Senior Alert” programs help identify and locate missing seniors with cognitive impairments (i.e. Alzheimer's Disease, dementia etc.). Modeled after the United States federal Amber Alert system for abducted children, Silver Alert programs create an emergency notification system in which law enforcement agencies broadcast using radio, television and electronic highway signs. Read details on how Silver Alert legislation started.